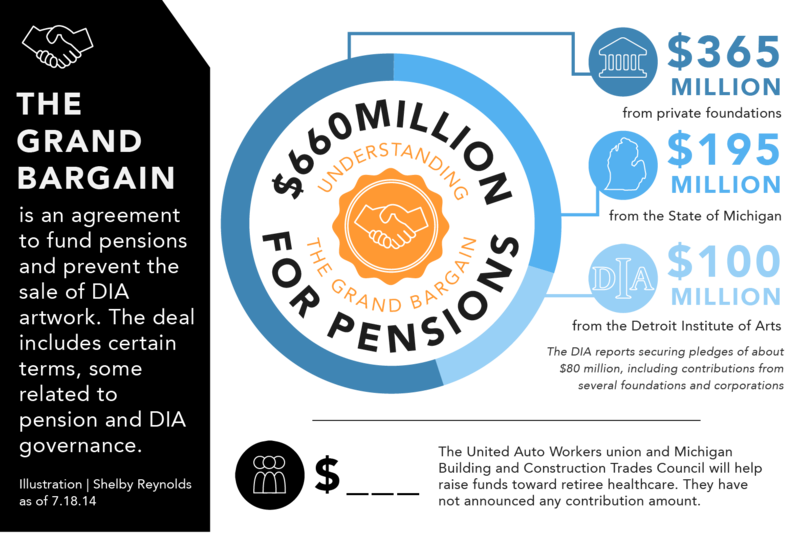 Could the foundation contributions to Detroit’s pensions be a model for Buffalo, Chicago, Cleveland or St. Louis? Foundations in other Rust Belt cities should contribute to underfunded municipal pensions, argues a Manhattan Institute author, so that city leaders don’t need to sacrifice city services for long-term financial obligations like retirement funding. After all, says Howard Husock, the Institute’s vice president for policy research, that’s what foundations did in Detroit’s “grand bargain” during the city’s bankruptcy case: 12 local and national foundations pledged $366 million toward the city’s pension funds which both saved some cuts for retirees’ payments and guaranteed the city-owned art collection would not be sold to pay creditors. With other cities facing long-term liabilities that are forcing budget decisions about funding pensions or services, Husock says municipalities could use a financial boost from their locally based foundations, which have net assets in the billions. Earlier this month, the Manhattan Institute. which calls itself a “free-market think tank,” published Husock’s paper “The Pension Grand Bargain: A New Reform Model for Cities.” In it, he describes the significant long-term pension obligations in Buffalo, Chicago, Cleveland and St. Louis, arguing those cities’ pension funds could benefit from an infusion of foundation cash, especially as populations decline and poverty rates remain high. “The pension problem is very serious for a lot of cities around the country, especially in the upper Midwest. It’s so serious that the payments to meet pension obligations are crowding out core city services, just as was happening in Detroit,” Husock says. His research, based on the cities’ Comprehensive Annual Financial Reports, found general declines in the shares of those cities’ budgets being spent on public safety, streets and sanitation, and recreation. That conversation caused “dismay” for Terry Mazany, president and chief executive officer at The Chicago Community Trust, when he read Husock’s paper. He calls it an “overreach” of the role of foundations and the funding decisions they make. Mazany says one of philanthropy’s roles is to work with municipal governments on specific projects, not simply make large financial contributions for what are a city’s contractual obligations for pension funding. “Foundations can use their agility, their convening ability, their research capacity and the ability to invest in innovations,” he says. For example, The Chicago Community Trust foundation helped to underwrite an economic plan for growth following the Great Recession, contributed to a citywide cultural plan, funded work on a justice system reform effort, focused on youth employment and worked on restoring community trust in law enforcement. “These are all much more sensible ways that philanthropy can either help to leverage and extend public resources or to seed innovation that government can then build on,” Mazany says. Representatives of community foundations in Detroit and St. Louis declined requests for interviews. Requests went unanswered for interviews with community foundation leaders in Cleveland and Buffalo. Rob Collier, president of the Council of Michigan Foundations, which represents philanthropic organizations throughout the state, says Detroit’s “grand bargain” can not be a model for other cities with financial distress. It was the bankruptcy, he says, that was the catalyst for the coalition of foundations contributing to the city’s pension funds in the grand bargain. Foundation leaders recognized the need to get the city’s Chapter 9 case over as quickly as possible to get the city back to local control, normal operations and with lower legal fees in the case. The Manhattan Institute piece, according to Collier, is suggesting something that is not a “normal charitable good” as defined by the Internal Revenue Service, a tenet that dictates how foundations spend money.